In this age of marketing economy it is important to be visible to prospective buyers for as long as possible. In the presence of multiple suppliers selling the same or similar range of products the need for publicity becomes more crucial. Advertisement is no longer limited to print and electronic media represented ideally by newspapers and television channels respectively, but extends to digital variety represented by online advertising sites. 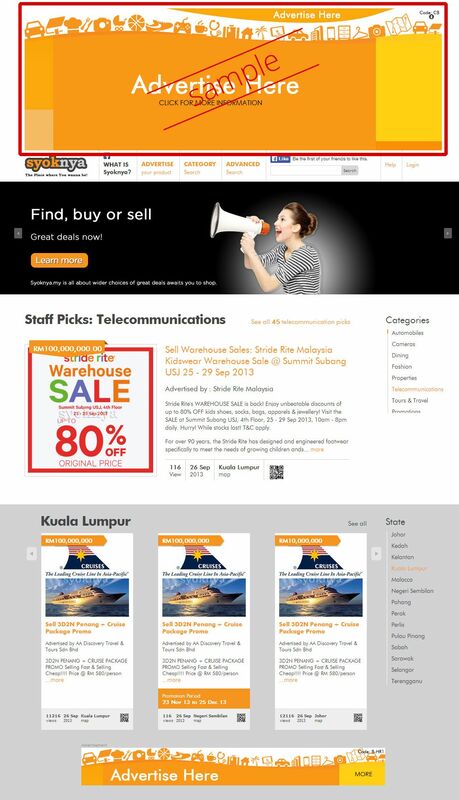 Syoknya is your Malaysian Online Advertising Partner that gives exposure to your products or services to millions of buyers and sellers in Malaysia. We offer a prefect avenue with feature advertisements for reaching out to millions of buyers and sellers in Malaysia instantly and in a cost-effective manner. The options offered by us are many and include Regular Ad, Featured Ad, Popular Ad, Staff Pick Ad, Collapsible Banner Ad, Slider Banner Ad, Regular Banner Ad and Free Ad advertisement (free credits) to advertise your products or services in Malaysia. Buyers are immensely benefited by the presence of several advertisers and marketers selling equivalent commodities or services. Our website not only caters to the needs of buyers who form the demand side, but also sellers and producers that make up the supply side. Here it needs to be noted that though this side facilitates both suppliers and buyers, we are focused on advertising and marketing. 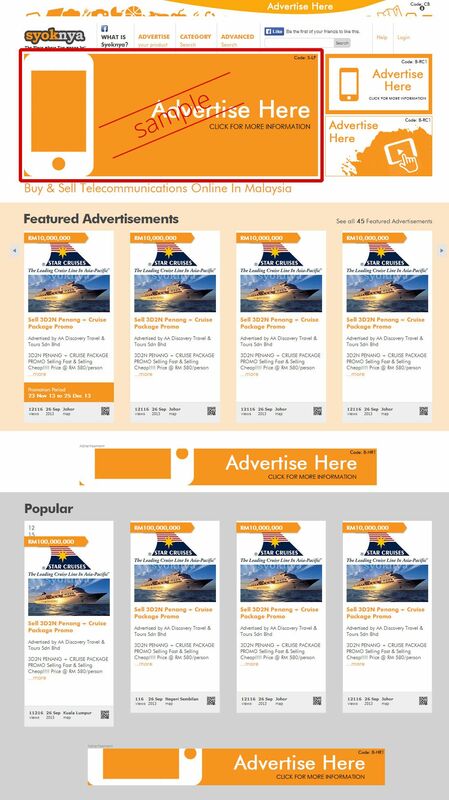 Regular Ad is displayed at the respective category listing page. Latest Regular Ad always listed on top of the list. Featured Ad is displayed at the top "Featured Advertisements" section of the respective category listing page, making them more likely to be seen and read. Your Featured Ad is 10 times more likely to be read than a regular ad. The prominent position at the top ensures your ad won't be missed. 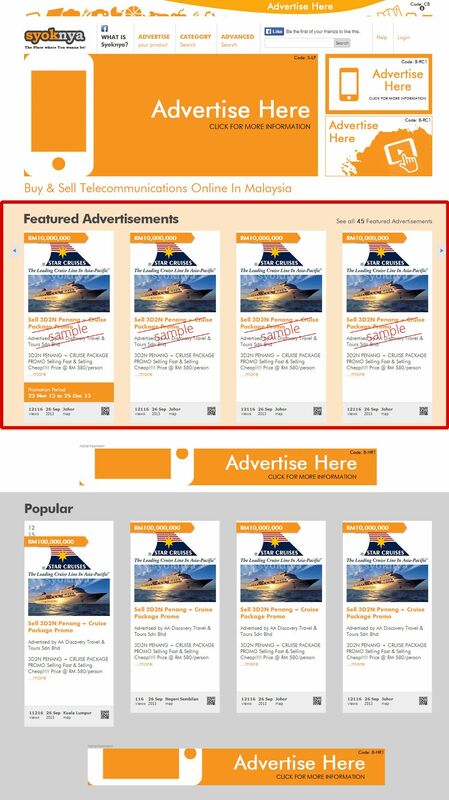 Popular Ad is displayed at the "Popular Advertisements" section of the respective category listing page. The most "Monthly Hit" ad always listed on top of the list. Your Popular Ad is 6 times more likely to be read than a regular ad. The prominent position at the top ensures your ad won't be missed. Let's start with some ways to promote your ad now. 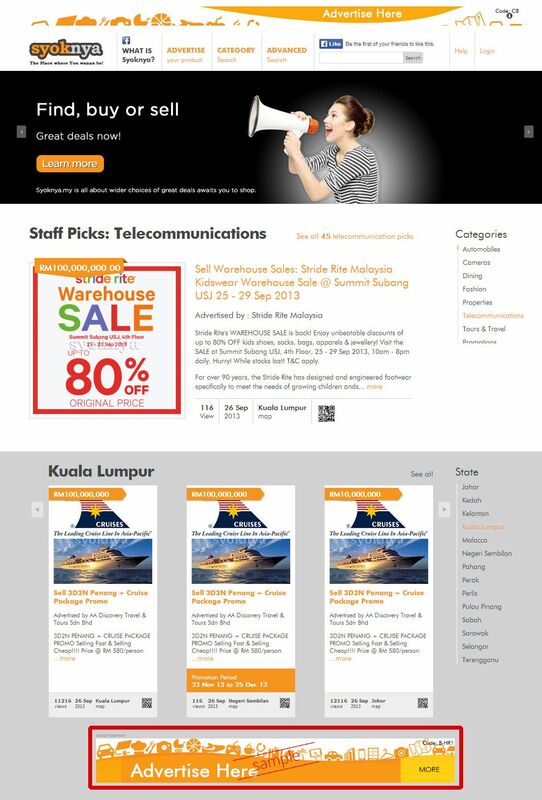 Staff Pick Ad is displayed at the "Staff Picks Advertisements" section of the landing page. Our reviewers random pick advertisements with proper writing in ad heading, description and uploaded nice & relevant images related to your ad. Banners are displayed in a portion of our website. Banner is always colorful and with a catchy caption. Banner is allowed with an URL for external website link or link to your ad. It's powerful exposure for your brand, products and services. Refer to below table for banner location, size and unique code to represent the banner type. Similar to offline media, our portal offers banner ad and advertisement feature services. Our banners are displayed in a portion of our website. A banner is always colorful and with a catchy caption. This banner could be stationary or scrolling depending on your choice. For a more detailed publicity you could opt for online brochures or catalogs style advertisement, with the former spread over a couple of pages and the latter over several. Our online brochures are meant to highlight one or two features about your product or service, a catalog is a more exhaustive treatment of the same. The purpose of brochure and catalog being distinctive are hence designed differently with more add-on features like Online Contact Advertiser Form, "How to get there" feature ** Link redirection to your Smartphone GPS Navigation App (Waze, Apple Maps and Google Maps), Ad QR Code, Customer Reviews and Social Media Sharing for your ad on social media sites. The entire feature ad can be easily maintained using Syoknya user friendly Content Management System (CMS) tools. We as an advertisement portal are open to all categories of marketers and suppliers. We have categorized our advertisers under: Automobile; Camera; Dining; Fashion; Property; Telecommunication; Travel; Promotions; Events; and Others. This categorization helps in easier identification for buyers. Online advertising is the latest form of publicity that has found acceptability among suppliers and consumers across nations and communities. Syoknya.my has been successful in capitalizing this trend and implement it fruitfully.